This project came about partly due to a slight obsession with things which emit many photons. I had a string of digitally addressable LEDs from Adafruit bought because well... They were shiny! 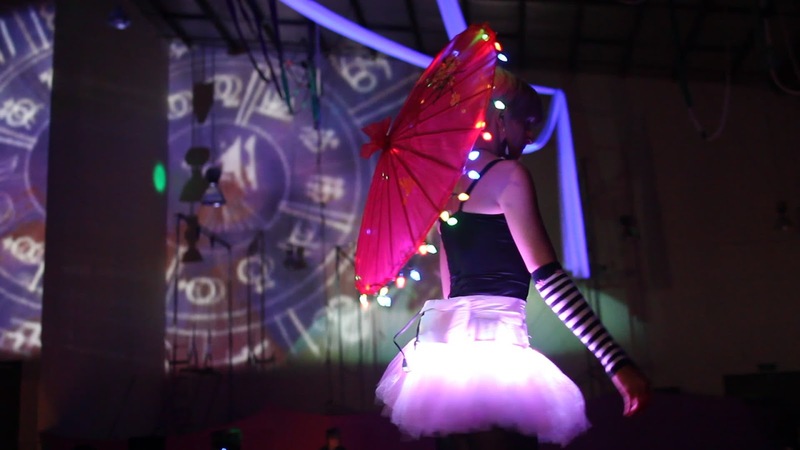 Enter Circillumina: An invite only rave dance party kind of thing... The perfect opportunity to play with glowwy lights. While throwing ideas around with Jillian and Rachel we decided that construction of some slightly out there costumes would be in order. Jillian is a stilt performer as one of her many many talents, she agreed to put on a bit of a stilt show at Circillumina 2 so a costume had to be created. Rachel had a tutu in her collection of dress ups and I had the lights... Time to do something cool. Rachel and Jillian started off by sewing the string of LEDs into the tutu whilst I ignored my nagging thoughts about how on earth this thing was going to be powered... The LEDs draw around 5W, not a small amount of power for something that has to run on batteries for several hours. The LEDs are controlled by an Arduino which I soldered a JST connector directly to. First test of UberTutu modeled by Rachel, Running Adafruit code. I have access to some pretty huge LiPo electric flight batteries, however I decided against this... The thought of strapping a battery which without warning can turn into an incendiary device to my friend did not appeal. I have a Pag C6 video light: This has a 6V 8Ah NiCad battery pack with internal fusing. It's big, heavy, ugly and in a form factor that's not very sympathetic to being fitted to the female form. It is however safe. I used two silicon diodes in series with the battery to reduce the voltage a bit as the LEDs are designed to run from 5V. I set about making a belt to house the battery that was comfortable and not too obtrusive. I purchased a couple of metres of a while parka nylon from Global Fabrics in Wellington much to the amusement of the staff there. After ten minutes with a pencil and paper I came up with a pattern. I cut the fabric out with a soldering iron in order to avoid the need to hem or fray stop the edges. Unfortunately there aren't any more photos of the battery belt being made up as time was running short.